Home » Why Aren't You Reading...? 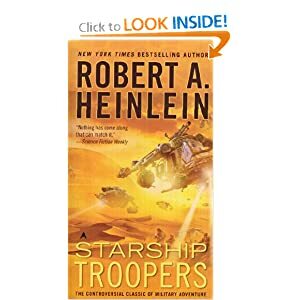 » Why Aren’t You Reading Starship Troopers by Robert Heinlein? Why Aren’t You Reading Starship Troopers by Robert Heinlein? This is a GOOD book. Below is a BAD movie. The war was just a background. The book was about these philosophical themes listed above. What it means to be a responsible citizen, to be a military enlisted man and eventually an officer. Its steeped deep in themes of tradition and honor. It is so revered by the Department of Defense that it is on the officers reading list. And so I made a horrible decision tonight. I watched the 1997 movie. Now I’m not going to sit here and compare and contrast the movie with the book. I can’t bear to do it. I feel horrible after just watching the whole thing and others have done it better. Read the review. The Nostalgia Critic knows his stuff. Yes. That is Gary Busey’s son. Playing a neon green violin. What I am going to do it try to make amends to Heinlein for what the 90’s did to his book. Click this link. Buy the Book. If you don’t absolutely love it. Send me a the receipt and I’ll PayPal you the cost + shipping. I’m not kidding. Hell, send me a picture of you with the book and a thumbs up for my blog and I’ll do the same. I just want to do my part for a book that did what all great fiction should do: it changed how I think and see the world around me. Good night all. Dreaming of Neon Violins. Todd. By Teagan Gilbert in Why Aren't You Reading...? on August 31, 2012 .